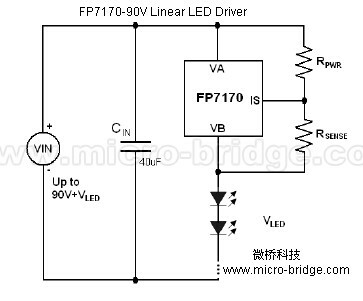 The FP7170 is a adjustable high voltage constant current LED driver. It can operate with power supply from 5V to 90V. The current flow from VA pin to VB pin is regulated with current value set by an external sense resistor RSENSE. To avoid FP7170 from overheating when VA pin to VB pin voltage is large, one extra resistor RPWR connected between VA pin and IS pin is suggested to share the power dissipation. The FP7170 is available in SOT223 3 pins or TO92 package.